NYTimes: The Problem With Flogging A.I.G. Joe Nocera has summed up what I've been feeling about this circus Congress has been running around AIG and the other companies. The US Government, which means all of us, is the majority shareholder of AIG. IF we want to have a chance of getting our investment back we need to make sure we keep the best around especially in the profitable areas of their business. Think about it, these divisions are profitable so hopefully that means those employees actually know what they are doing. They might even be superstars who could easily bail to a hedge fund, or other company that isn't under the gun of the 90% bonus tax. Unfortunately many of the business run on people's minds not a factory or assembly line. two are making it but definitely have some issues. There must have been something blooming as I saw bees returning with little pollen loads. 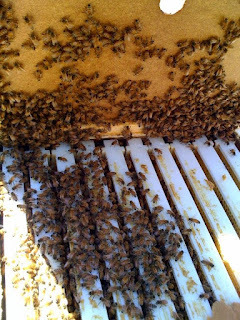 To provide some extra nutrients I mixed up some pollen patties and placed them in all three hives. Hopefully with this will help them spur extra population growth. After a successful first season of beekeeping, I'm anxiously awaiting the first weekend in April when I'll pickup three three pound boxes of bees to setup three additional beehives. Assuming my three current hives make it through the winter and it's a great honey season I should harvest about 15 gallons of Madoff honey. I joke around that maybe the bees were harvesting the nectar from Madoff's flowers at his Montauk compound, but that's too far for them to fly. I've picked up a few domains just in case I ever decide to make a business out of this, BeeHampton.com and BeeHamptonHoney.com. For now it's fun enough just doing this as a personal endeavor. What have I learned from my first season as a beekeeper? 1. If you're careful you don't need to wear gloves - Being gentle and using smoke keeps the bees happy and docile. 2. Bees are fascinating to watch and you can waste hours watching them - I'm looking into an outdoor webcam so I can let everyone learn this valuable lesson. 3. I'm dumb - I initially setup one hive, but was told I was dumb by a family member, get more you'll invest the same amount of time. He was correct, so I ordered two more. The only problem was those two did not produce any honey, just copious amounts of propolis. This year they should produce otherwise I'll need to switch out the Queen bee for better genetics. 4. Everyone wants some of my honey - I need to buy smaller containers so I can fulfill as many requests as possible. 5. Beekeeping videos are entertaining - I made a few videos last year, this year I'll video tape the whole experience from picking up the boxed bees to the installation and I'll take more photos. After reading the The 4-Hour Workweek by Tim Ferriss, I started following his blog in my feed reader. Normally the posts are interesting, although not completely applicable for my life, but a recent post caught my eye. Tim is putting together a challenge with an anonymous patron to donate $3 for each person who signs up and starts following him on twitter between now and March 23rd. If he hits his goal that will mean $150K for some well deserving public schools. If you haven't tried twitter here's a perfect reason to start. If for some reason you don't like his tweets, just unfollow him after March 23rd. After much harassing by Brian T, I've made the switch to Disqus. We'll see how it works.